There’s never a shortage of awesome things to do in Philadelphia — but if you’re visiting for the very first time, what are they key things you just can’t miss? It doesn’t make a sound, but The Liberty Bell’s message rings loud and clear: “Proclaim liberty throughout all the land unto all the inhabitants thereof.” This inscription on the cracked but mighty bell is one reason it became a symbol to abolitionists, suffragists and other freedom-seekers around the world. 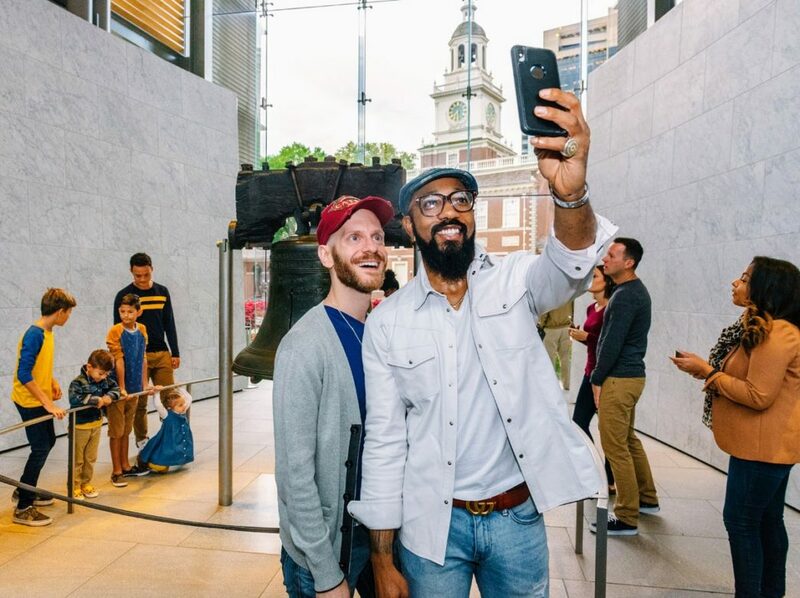 The bell, which is free to visit year-round with no tickets required, draws people from around the nation to snag a photo in front of the soaring glass walls overlooking Independence Hall. Since Rocky’s first triumphant run on the silver screen in 1976, the steps of the Philadelphia Museum of Art have become an international destination. Travelers from around the world embark on their own jog up the stairs, pumping their fists in the air as they cherish the spectacular view of the Benjamin Franklin Parkway and the city skyline. To finish off the experience, head to the bottom of the stairs and snap a photo with the bronze statue of Rocky, originally created for Rocky III. One of the City of Brotherly Love’s best-known landmarks is LOVE itself — the Robert Indiana sculpture in John F. Kennedy Plaza (or LOVE Park, as it’s referred to by many). The sculpture was recently restored and repainted, and the park was entirely redesigned to add more green areas and a high-tech water feature. The AMOR sculpture — a Spanish version of the LOVE sculpture — is on display at Sister Cities Park, a short walk from LOVE Park. Set below a former railroad terminal, Center City’s 125-year-old Reading Terminal Market serves as both a dazzling tourist destination and a source for fresh produce, seafood, meats and cheese for locals. The public space also provides open seating where customers can enjoy meals from dozens of restaurants, including Pennsylvania Dutch cuisine and acclaimed DiNic’s hot roast pork sandwiches. Retail merchants sell housewares, jewelry, linens and more. The Benjamin Franklin Parkway, modeled after the Champs Elysees in Paris, is sometimes called Philadelphia’s most artistic mile. Some of the city’s most important cultural institutions are housed here, including the Barnes Foundation, The Franklin Institute, The Academy of Natural Sciences of Drexel University, the Rodin Museumand the crowning Philadelphia Museum of Art. (Another super-popular attraction, former prison Eastern State Penitentiary, is just a 15-minute walk from the Philadelphia Museum of Art.) No Philly experience is complete without a dip into the city’s cultural offerings. City Hall has been the home to Philadelphia city government for more than a century. Once the tallest building in the U.S., the elaborate 14.5-acre masonry structure remains the country’s largest municipal building, and its exterior features more than 250 sculptures. Residents and visitors can enjoy an interior tour that explores the building’s history, art and architecture or a 15-minute tower tour. Both tour options include a view from the observation deck, located below the 37-foot-tall, 27-ton bronze statue of William Penn atop the clock tower. Once made up of undeveloped piers and underutilized public spaces, the Delaware River waterfront has become one of the most activated spaces in Philadelphia in the 21st century. That’s thanks to the opening of a number of exciting attractions and parks — Cherry Street Pier and Race Street Pier as well as seasonal spots like Spruce Street Harbor Park and Blue Cross RiverRink — and diverse and well-attended events throughout the year. Plus, those gorgeous views of the Benjamin Franklin Bridge — which connects Philadelphia to New Jersey — don’t hurt, either. In 1821, the creation of the Fairmount Dam, now behind the Philadelphia Museum of Art, turned the Schuylkill River into a placid surface ideal for rowing. By the mid-19th century, the city approved the construction of the 10 charming crew clubhouses that make up Boathouse Row. Now a National Historical Landmark, the boathouses — still in use today by amateur and collegiate crew clubs — provide one of the city’s most recognizable and Instagram-worthy sights. Get a close-up view during a stroll along Kelly Drive or a wide-angle look from Martin Luther King Jr. Drive, and don’t miss the boathouses at night, when glittering lights framing the boathouses create idyllic reflections on the river’s surface. ← Care Bears Jed Ryan and Joe Mannetti team up for “Baskets For Iris” in New York City”!